William F. Bell first opened this course back in 1970. He was a legendary course architect in California, and that is why Knollwood Country Club tee times are sometimes hard to get. The course has a slope rating of 123 and a course rating of 70.1 from the blue tees. There are also closer tees available for all skill levels. The first hole at Knollwood is well-regarded as one of the toughest holes in Southern California. The beautiful layout takes place amongst Eucalyptus and Pine trees. The former players for this course have called it both challenging and fair, and countless people continue to return to this venue each year because of the good prices and amazing golf atmosphere. You can even get warmed up on the driving range or putting green. If you are travelling to the area, you can also rent clubs for your round. The beverage cart is another great luxury of this course. Granada Hills tee times are not easy to get, especially during the cooler times of the day. You need to get online or call the pro shop right to get the best tee time you can. 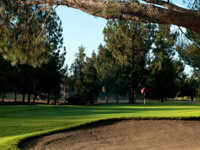 There are also many great Granada Hills golf deals that will save you some extra money. These discounted times vary by time of day and year, so check with the course before booking.